Really, in our generation, we haven’t seen a Raiders-Chiefs game of anything close to this magnitude. But in this second meeting between the clubs in 2016, this could be the biggest one in decades. Arrowhead Stadium will be rocking for the 10-2 Raiders, who are undefeated on the road, and the 9-3 Chiefs, who are unflappable at home and coming off two improbable road wins in Denver and Atlanta. Though the Raiders continue to amaze in pulling out fourth-quarter comebacks, they have been asking to be beaten in recent weeks. Eventually, their fourth-quarter magic and road luck will run out, and Arrowhead might be the imperfect storm. 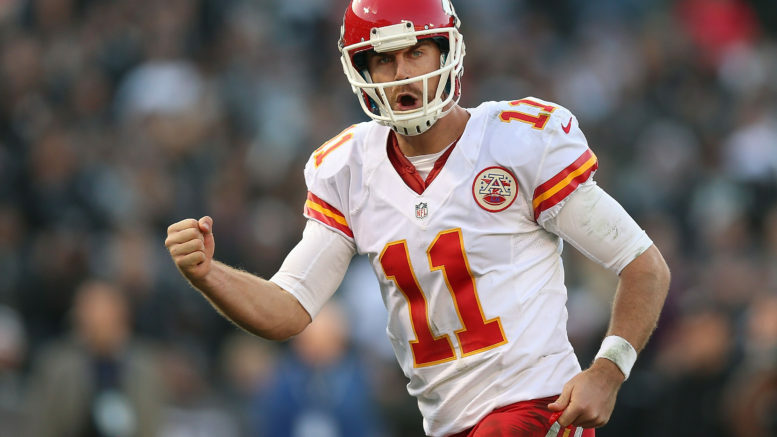 The Chiefs can seize first place with a win, considering they have already posted a 26-10 victory over Oakland in Week 6 in which QB Alex Smith completed 19 of 22 passes for 224 yards. Another mistake-free game will go along way for KC. My gut feeling is unless the Raiders can score a touchdown on either special teams or defense, the offense won’t carry the day again.Here’s hoping we get another Oakland-Kansas City thriller as we did in baseball a couple years ago, when the Athletics and Royals gave us an instant classic in the 2014 AL wild card game. Take the sea of red in this one. Pick: Chiefs. Be the first to comment on "NFL Week 14: A Thursday Night Pick, and a Parody"